The attorney for a Boulder City resident is asking the charges brought against his client by the city be dismissed due to misconduct by the prosecution. YouTube Video The initial dash-cam video given to Boulder City resident John Hunt's defense attorney includes red print and identifies the feed coming from unit 277. Hunt has been charged with obstructing traffic and resisting arrest after he repeatedly walked back and forth in a marked crosswalk protesting a police-sanctioned pedestrian enforcement detail. 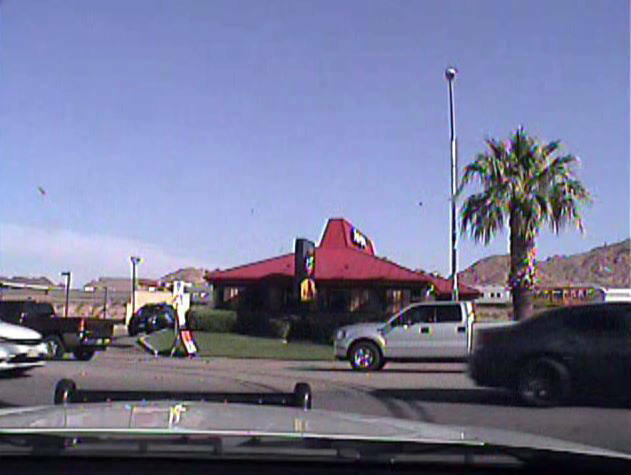 Submitted evidence In the dash-cam video provided to the defense on July 5, 2017, by the Boulder City Police Department there is no red print or unit number. Attorney Stephen Stubbs filed a motion to dismiss in Boulder City Municipal Court on Tuesday afternoon, in which he said that the either the city, the Boulder City Police Department or both had manufactured false evidence in the form of dash-cam video against his client John Hunt and given it to the defense. “By manufacturing false and fraudulent evidence, the city attorney’s office, the Boulder City Police Department, or both have tipped the scales of justice so far that the scales themselves have fallen into a bog of eternal stench,” said Stubbs about Tuesday’s motion. Hunt was arrested June 8, 2016, by Boulder City Police Sgt. John Glenn on several charges, including obstructing traffic and resisting arrest after he repeatedly walked back and forth in a marked crosswalk protesting a police-sanctioned pedestrian enforcement detail. Stubbs was given the dash-cam video from the Boulder City Police car, and found surveillance video of the incident from a nearby business. In the dash-cam video, Glenn seemed to be aware that Hunt was protesting, and the surveillance video did not seem to support the charges brought against him. The charges were dropped the later that month. “Two separate audio forensic experts have confirmed that the video contains the wrong unit number … proving that, at a minimum the metadata was altered …. The defense does not know how much of the video was altered or if an authentic video even exists anymore,” Stubbs wrote in his motion. Almost a year later, on June 5, 2017, the city brought five charges against Hunt for the incident. Less than a week prior, on May 30, Hunt’s attorneys brought a federal complaint against the city and the police department, accusing them of malicious prosecution, abuse of process, false imprisonment, negligence, assault and battery. In his deposition Nov. 20 for that civil case, Glenn said the city attorney’s office had released that first dash-cam video and shortly after had their access to the video program restricted. Glenn said that he and the department’s information technology person, Ben Jurek, had administrative privileges within the video program and that the other sergeants could also view their dash-cam video and their officers’ videos. In that deposition, Hunt’s other attorney, David T. Blake, showed Glenn the earlier dash-cam video of the event. The video, June 8, 2016, said that it was from Unit 277. The text of those items was in red print. Sue Manteris, spokesperson for Boulder City, said that the city had not seen the motion and could not comment on it. Judge Victor Miller will make a ruling on this motion at a hearing Tuesday, Dec. 5, at which time he could deny it, grant it and dismiss the case against Hunt, or admonish both sides and give Stubbs all the investigative and personnel files for this matter.